Hours of valuable training filled with up-to-date regulatory data - helping you master the key points and concepts of ecotoxicology and the environment. The course is easy to “pick up where you left off” - enabling you to study at your own pace. Runs on PC, Mac, tablet and smartphone - allowing you to study at work, from home or on the go, fitting your training conveniently around your busy schedule. No travel required - making it a time-efficient training resource that keeps your and your team’s travel commitments and expenses down. 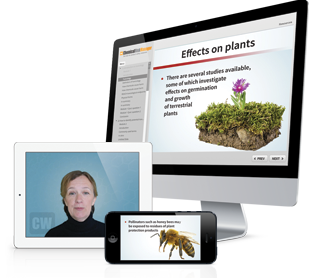 340 professionally-designed pages of content combined with 420 audio explanations and 126 videos - providing a self-paced course that supports trainees’ different learning styles and walks you through the key concepts. 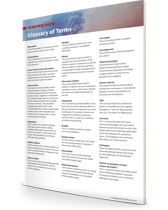 Extensive glossary of terms - helping you decipher key terminology. 15 Course Note handouts - for further reading and to help you revise the material on and offline. 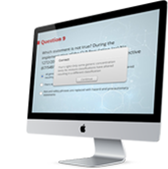 Self-assessment quiz questions - helping you measure whether you’ve met the learning objectives for each section of the course, giving instant feedback on your progress. Low per-trainee prices and attractive group rates - ensuring you maximise returns on your training budget.